Located on the Tims Ford Reservoir, the 2,200-acre Tims Ford State Rustic Park sits in the shadows of the Cumberland Plateau in south-central Tennessee. 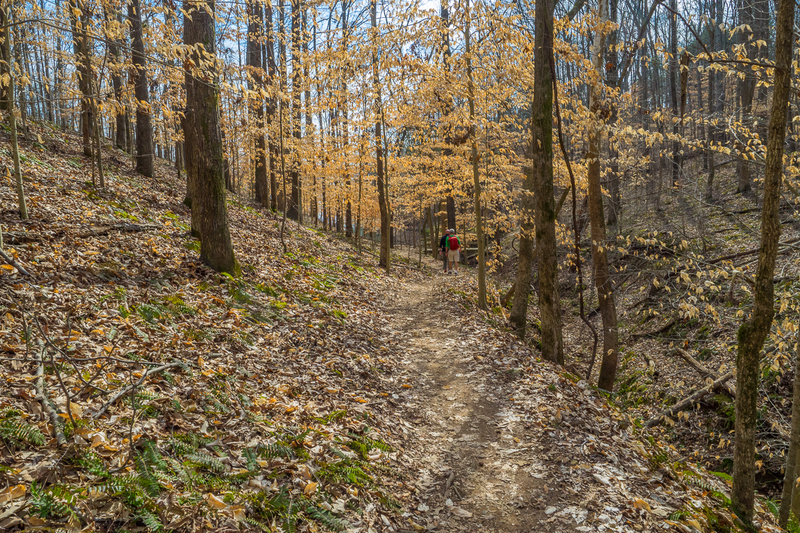 There are 6.5 miles of unpaved hiking trails found within the park, in addition to 22 miles of bike trails that may also be used for hiking. Two of the three hiking trails begin at the park Visitor Center, while the third wraps the shoreline near the park marina. Combining the Lost Creek and Marble Plains trails makes a nice loop along a portion of the lakeshore that is nearly three miles in length. Passing through beech and cove hardwood forest, crossing swinging bridges, and a visit to an historic 19th century church and cemetery all combine to make this a relaxing stroll during any season. We enjoyed this combo loop on Tuesday, March 17, 2015 from 3:30PM to 4:45PM. Our plan was to stretch the legs a bit after a pontoon boat ride on the reservior, taking the Lost Creek Overlook Trail to its meeting with the Marble Plains Trail for the return to the Visitor Center. Hike Configuration: Loop Blaze: Red and yellow. Hike Rating: Easy. There is some up and down, but nothing excessive. Trail Condition: Excellent. Well maintained smooth dirt surface, and some asphalt. Starting Point: Trailhead behind the Tims Ford State Park Visitor Center. Trail Traffic: We encountered only one other hiker during our trip around the loop. How to Get There: From Estill Springs, TN take Rock Creek Rd. 5 miles to TN-130 S. Turn left onto TN-130 S. for 0.8 mile, then turn right onto Pleasant Grove Rd. for 2.7 miles. Turn left onto Awalt Rd. for 2.7 miles, then left on Mansford Rd. for another 1.6 miles. Turn right into the state park on Tims Ford Rd. It is 0.4 mile to the Visitor Center. Last summer one of our merry band of Meanderthals moved from Western North Carolina to South-Central Tennessee. We haven’t been quite to same since. So, it was time to do something about that. The remaining two of us packed up all our cares and woes and ventured across the border for a visit to Meanderthals West. After checking in at our friend’s fancy new digs, it was off to the Tims Ford Marina for a ride on his pontoon boat, and a chance to decompress after the six-hour drive. Tims Ford’s sprawling arms of water are popular with canoeists, kayakers, and anglers as evidenced by the very full marina. The weather cooperated completely with our aqua foray into coves and around islands that were creeks and ridges not too many decades ago. Relaxed now, it was time to head just a quarter mile up the road from the marina to Tims Ford State Rustic Park, and the Visitor Center there. Directly behind the building is the trailhead for the Lost Creek Overlook Trail. The outward half of this loop hugs the shoreline of the reservoir, curving in and out of all the fingers that stretch into the water. The lake level was about six feet low, displaying a “bathtub ring” that enables those with homes along the shore to clean their docks and beach fronts. We noticed immediately the forest was filled with young beech trees. This area had obviously been logged some time ago as there were no mature trees, but the second-age beech were still displaying their late-falling khaki leaves, enhancing an otherwise drab winter woodland. The trail through here is well-packed dirt, smooth and easy to navigate, with few root or rock obstructions. It is ideal for joggers, walkers, and Meanderthals. You will cross first one, and then a second swinging bridge that stand perhaps 15-20 feet over natural drainage channels in the terrain. If you want a little fun, try walking with your entire group (no more than 6 though) across the bridge simultaneously, and see how well you can control your cadence. You’ll be reaching for the handrails in no time. At the 1.5 mile mark you will reach the Lost Creek Overlook, a small wood plank platform constructed on a point where you can observe the islands that surround what was once Lost Creek. Farther off in the distance are The Narrows below Cline Ridge that approach the Tims Ford Dam. This is also the junction with the return-side Marble Plains Trail. Additionally, you can pick up the 15-mile Shoreline Trail here, but that wasn’t quite on our agenda for the day. After a half mile of wandering through the forest, the Marble Plains Trail meets Marble Plains Road, a gravel track that takes you to the whitewashed Marble Plains Baptist Church. First opened in 1857, this historic steeple-topped structure is surrounded by a cemetery with headstones that date back before and during the Civil War. It’s all quite lovely, and no doubt even more so in Autumn when surrounded by the colors of the changing woods. The gravel road leads to the dirt trail once again on the back side of the church, then turns to paved asphalt for the final half mile back to the Visitor Center. There are benches every couple hundred feet so you can sit a spell and watch the kids play in the meadows that line the pathway. Bring grandma too, as it’s a nice area for multi-generations of your family. Tims Ford State Park has full-featured recreational opportunities including a marina that provides equipment and supplies for boating and fishing, a boat launching ramp and dock. The marina also includes a snack bar, bait shop and fish-cleaning area. Jet skis, pontoon boats, fishing boats and canoes are available for rent. The park has 20 beautiful cabins situated on the wooded slopes and two campgrounds for tent or RV campers. In addition, with a permit from the park office, tent campers may stay on any of the six islands on the lake. Another popular activity is golfing. The park is home to the Bear Trace at Tims Ford course which is part of the Jack Nicklaus-designed collection. The Tims Ford Reservoir is visible from most holes on the course and comes into play on several. In summary, it was great to see our friend and original Meanderthal again. He gave us a grand tour of the opportunities he has for fun and exercise in his new neighborhood. This loop hike was a nice way to unwind after hours on the road, and prepared us for a more thorough exploration the following day. Tims Ford State Park is great for the whole family, is a four-season destination, and a relaxing place to get away from the busy life in Chattanooga or Nashville.